Bring a pot of salted water to a boil. Once boiling, add half of the lemon juice. Cut outer leaves of artichoke, and slice them in half, lengthwise. Remove center/heart. Submerge artichokes in boiling water until softened, but not falling apart, about 10 minutes. Remove from pot and brush artichokes with oil. Season with salt and pepper. On your hot grill, place artichokes cut-side down and grill until grill marks emerge, roughly 3-5 minutes on each side. Meanwhile, combine remaining ingredients to make the lemon yogurt aioli sauce. Don’t overcook the artichokes to retain their fresh flavor. Vanessa Bell Do you love the taste but find the idea of cooking artichokes intimidating? Me too! Artichokes are beautiful and filled with flavor, creating a culinary experience that is second to almost none. But when cooking artichokes goes wrong, it goes terribly wrong, and makes so many of us afraid to even try. Here, I’m making an artichoke recipe that is perfect for summer nights. 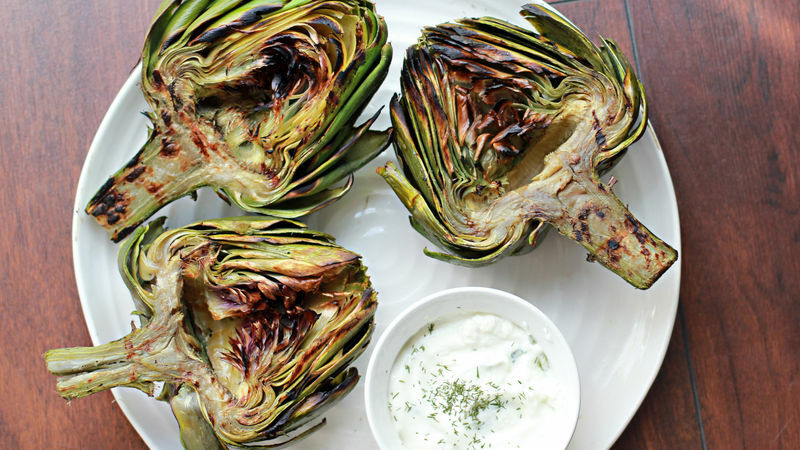 Enjoy these grilled artichokes served with a refreshing side of lemon yogurt aioli.